The amount of water that flows down a river is guaged as cubic feet per second, or cfs. The North Fork of the American is a free flowing river which means there are no dams in the mountains to hold back water upstream from the section that we conduct trips. Water flows are dependent on snow melt so for most of the year the North Fork is just a trickle with water flows ranging from 200-400 cfs but during the months of April to June the Sierra snows melt and the river swells to 1000-3000 cfs which is ideal for rafting. Conditions on the North Fork vary from year to year based on the amount of winter snows we receive. In years of below normal snowfall we may have a limited season or no season at all on the North Fork. On the other hand, the South and Middle Fork American both have upstream dams and reservoirs that store the melted snow runoff to later release it for hydroelectric production. On the Middle Fork the water agencies respect the needs of whitewater rafters and kayakers and release water for 4-5 hours daily all summer with normal water flows ranging from 900-1200 cfs. The water agency that controls water storage and releases on the South Fork American recently signed a new 50 year agreement that guarantees excellent water releases all summer. 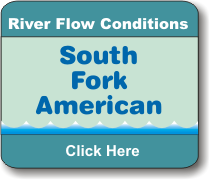 In past years we had to deal with uncertain water releases but now we can promise you excellent water flows for your trip on the South Fork American, even in years with below normal rain and snowfall. As of March 2019 the Sierra snowpack is 160% of normal due to record February snowfall. We are expecting high water flows on all forks of the American River through June which will make for exciting raft trips for thrill seekers but not recommended for younger children. Contact EarthTrek for the latest conditions. Click the links below to see current hour to hour releases on the Forks of the American River.